Fall wedding season is in full swing! On Saturdays throughout the fall months our team can usually be found either on location at the beautiful wedding venues throughout eastern North Carolina including Abilena Plantation, Neuse Breeze, The Dunes Club, Beaufort Boat House, Tryon Palace and lots of other gorgeous settings or in the salon where the energy is alive with bridal parties sharing their morning with us. Fall in eastern North Carolina is gorgeous. Temperatures start to drop and we notice a slight break in the humidity (thank God!). This past Saturday our team was a part of 3 different weddings! Yes, 3! We began the morning bright & early at a beautiful room at the Aerie Bed & Breakfast in our beautiful downtown New Bern, just a block over from Tryon Palace. Kari the bride & her mother, future mother-in-law and future step-daughter welcomed us to a beautiful siting room in their suite where we set up for hair & makeup for Kari & her maid-of-honor. Our team has it down to a science now for traveling on location and improvising setting up in a new space. This was our first time on location at the Aerie & it we loved the ornate decor & antiques that gave the vibe a feeling of years past. It was quiet & Kari was able to relax & unwind before the day's events. We did a trial run on Kari when she was in town from Maryland a few months back to make sure the style she chose would be what she had in mind, especially with veil placement & a beautiful crystal headband she found on Etsy, so we were well prepared & new of any adjustments that we had discussed during her trial. She chose a curly formal style that was higher on her head with the veil placement underneath. The whole look with the headband & veil was stunning. Her makeup perfectly highlighted her natural beauty & gave her a polished wedding glam look. She looked drop dead gorgeous! We also have to mention how sweet Kari's fiance was during the planning process, we surprised her with the suite at The Aerie & was so wonderful to communicate with us any details we needed to be in on the surprise. We are so honored to be apart of this beautiful couples special day. After finishing up with Kari we headed back to the salon for bridal party #2. Kimberly & the 7 ladies she asked to be a part of her bridal party definitely brought such fun energy to the salon. You could really tell these girls have amazing bonds with each other & it was super stress-free full of laughter & love! Kimberly also did a trial run with us a few months before her wedding while in town from Raleigh. She chose an elegant low formal style with volume in the crown. Her makeup was natural yet glowy, and like Kari also highlighted her naturally beauty perfectly. Her bridesmaids all mixed it up a little bit with different variations of up-dos for the big day. A few incorporated braids & they all agreed that having it up would be easier for the day's events & the 80 something degree weather we had on Saturday. We couldn't agree more with them. 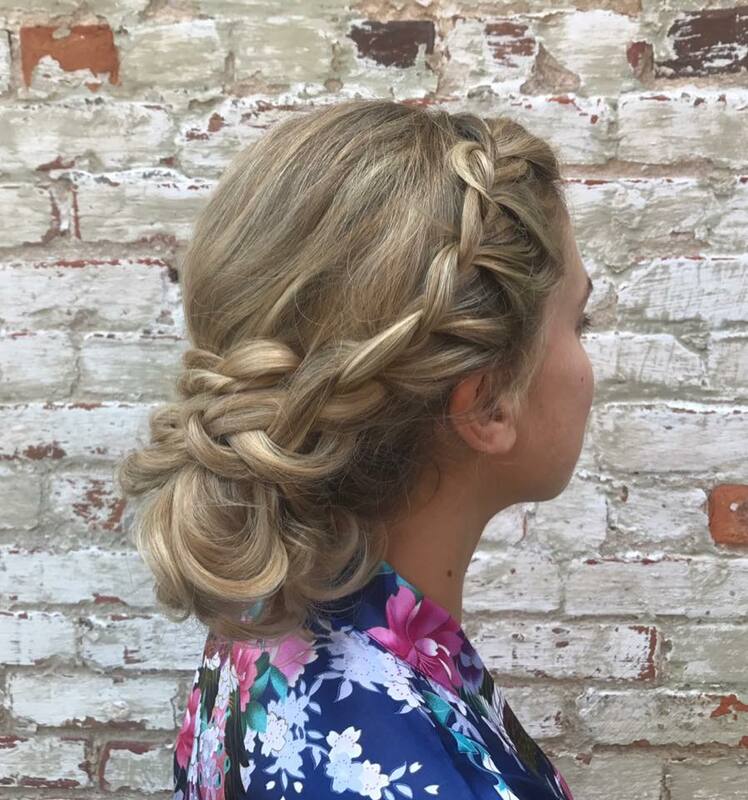 In fact, we usually recommend doing a formal style that is up off your neck and out of your face so that you don't have to worry throughout the day if your hair begins to frizz from humidity or cur falling out. We also love when brides let the bridesmaid choose a style that is best for their hair texture, length & thickness. It's sometimes hard to replicate the exact same style on different hair types. Although they will still look more uniform with everyone going with a style that is up, they each get to express themselves a little bit differently. Our next bride came to us all the way from Pennsylvania for her wedding at the beautiful Isaac Taylor Garden that is conveniently right across Craven Street from the salon. 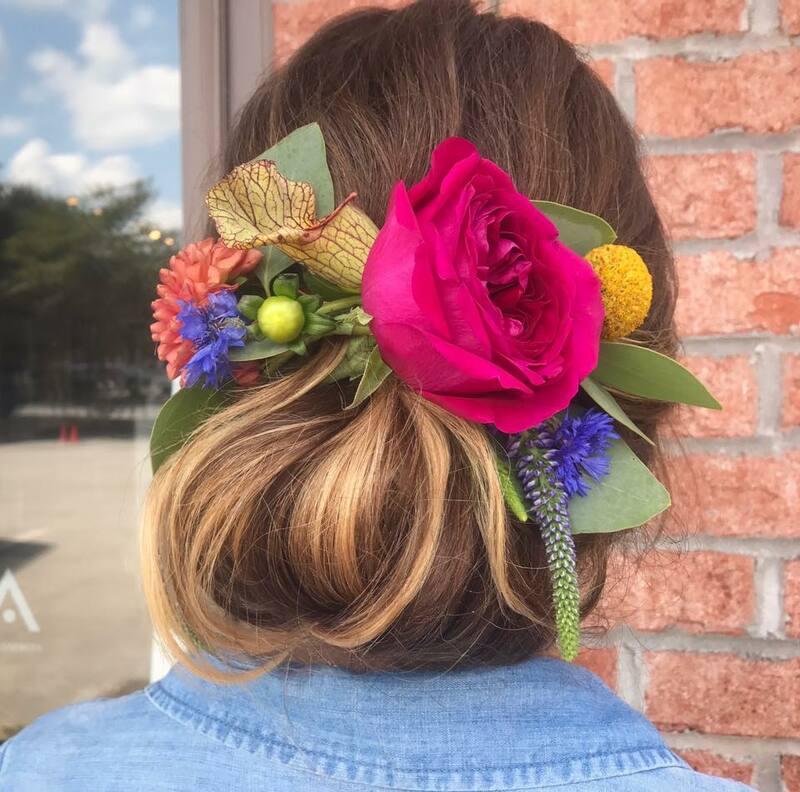 Molly works as a florist in Pennsylvania, and her floral skills sure showed through the flower piece she created to wear in her hair. Due to the long distance Molly was unable to come in for a trial run for her hair & makeup but thanks to technology we were able to correspond through e-mail where she was able to send inspiration photos she found online so that our team could prepare for what she had in mind. Her inspiration photo was a low chignon type of style that was very romantic and not super structured. 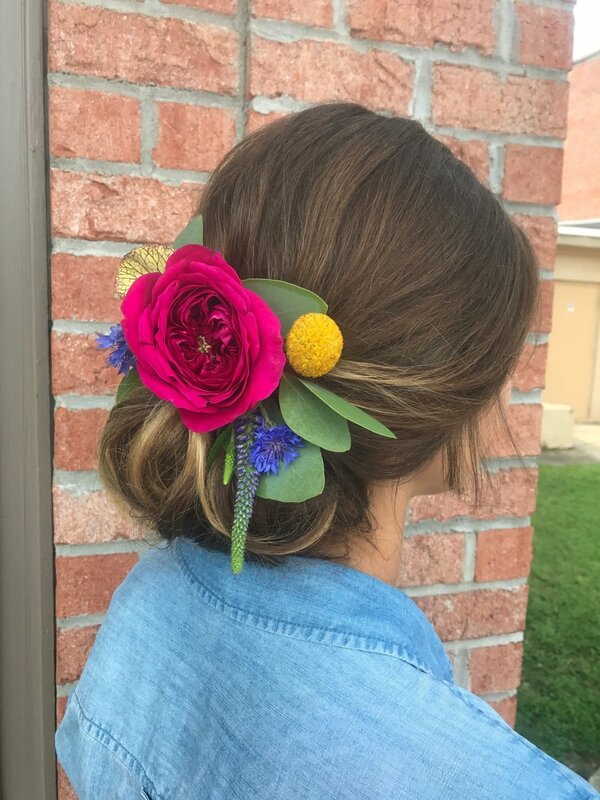 She originally planned to wear the flowers as a flower crown around her head but after placing it when the style was finished Molly & her stylist Brooke decided it would look better with the flowers at the top of the chignon. Boy oh boy was this a style for the books, it turned out absolutely breath-taking & the colors of the flowers perfectly complimented her hair color & the approaching fall season. Her makeup was soft & reflective of her garden wedding & enhanced her beautiful features. It is an honor for us to be a part of such a special day. We love the magic that happens when a bride has everyone she loves come together from all over the country to be in 1 room surrounding her with love & happiness. It truly is special to see the laughter, tears, hugs and memories created at Magnolia Jane on the morning of weddings. Our team works so well together & 3 brides in 1 day was nothing short of perfect because of the support, communication & preparation we put in to make sure that not 1 detail is left untouched. Your wedding day is just as special to us as it is to you and we thank you for allowing us to make memories with you on your big day! 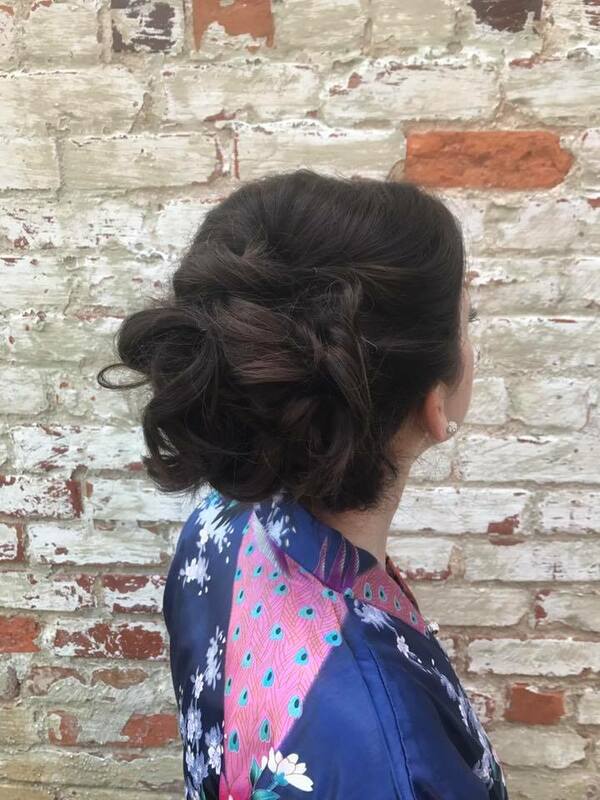 Magnolia Jane Salon has had an amazing yet very busy time with weddings since the opening of the salon in November of 2014. New Bern is definitely evolving into a destination wedding spot with brides traveling from all over the country to enjoy the majestic settings of our town's beautiful backdrops including Tryon Palace, Abilena Mansion, The Isaac Taylor Garden, The Whitford Plantation, as well as several beautiful churches and other stunning venues. It's not an easy task to take on, with some bridal parties totaling 10 plus people, but we must share that we absolutely love being a part of such a special day. Not only is Magnolia Jane Salon a beautiful backdrop for pictures with its' clean white walls adorned with crystal framed mirrors and a beautiful hanging chandelier located in the center of the salon, we offer a friendly, relaxed environment to begin one of the best days of your life! Not to mention, we are centrally located in the heart of downtown New Bern. What goes into creating the perfect wedding day look? Magnolia Jane Salon's owner, Laura McGovern, believes it is important to meet with brides in person, if they live locally, or speak with them in depth on the telephone or through e-mail to begin an open conversation with the bride about her expectations, desired wedding style as well go over in detail the services our team offers. The salon features an beautiful white antique table that Laura invites the bride to join her at to look over pictures for inspiration, discuss the desired services and create a personalized wedding glamour timeline. 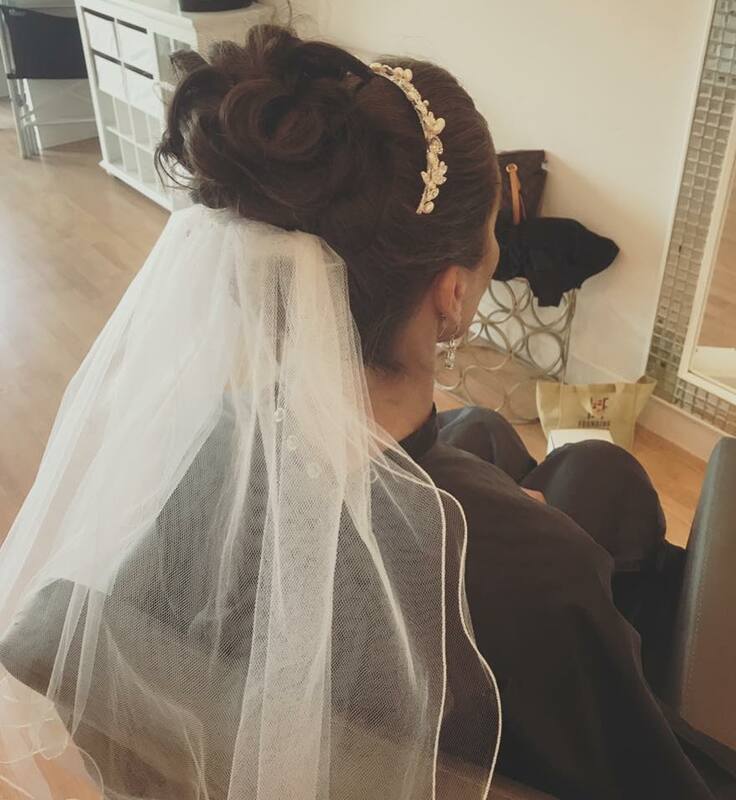 Some bride's enjoy having a run-through of hair and makeup before the big day to try different styles and looks as well as see the whole package together with their dress on (this sometimes helps with nervous jitters and is very calming to the bride before her wedding.) Laura recommends scheduling a formal trial-run the day of portraits, if the bride desires to have portraits taken prior to the wedding. Magnolia Jane Salon's makeup artists Ally Voshell & Ann Lane create a beautiful, customized look to enhance your natural beauty. Air brushing is an added option to create a flawless, smooth, picture perfect look. From dramatic smokey eyes to a natural sun kissed glow, our bridal looks are one-of-a-kind, show stopping gorgeous! It is an incredible honor to be a part of such an important day. Our team takes pride in knowing our work will be viewed in photos for many, many years passed down from generation to generation. Your wedding day is just as important to us, as it is to you. 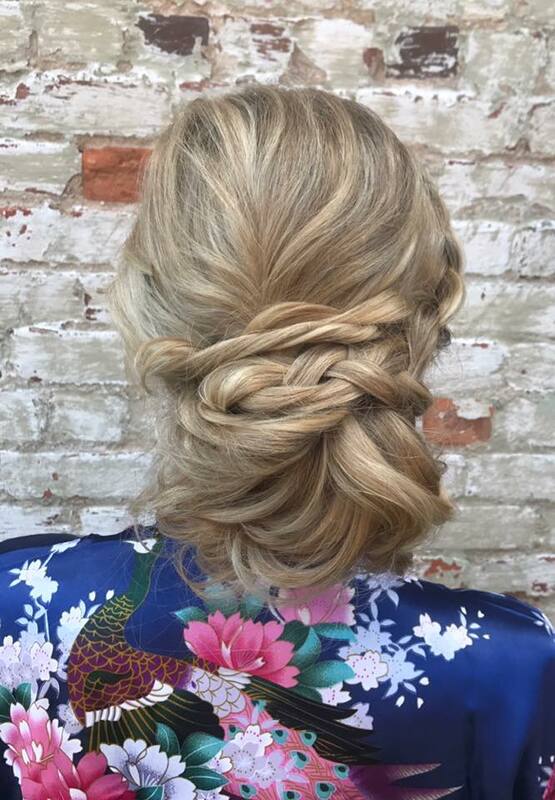 Magnolia Jane Salon is committed to providing a stress free, relaxed wedding glamour process by offering suggestions while also listening to your vision to create a look that is 100% you. We look forward to creating many more happy brides & sharing in such a joyous occasion!